Red Wheel ∕ Weiser Online Bookstore | The Living Light Cards by Meg Blackburn Losey, Ph.D.
As seen in Touching the Light and The Secret History of Consciousnes, the Living Light Symbols have been experienced by enlightened beings for millennia. Each symbol or combination of symbols is a full library of knowledge from the greatest concepts to the smallest of details. Each is also an initiation, an ancient key; to open an awakening to the vast knowledge and giftedness that each of us carries locked within us. 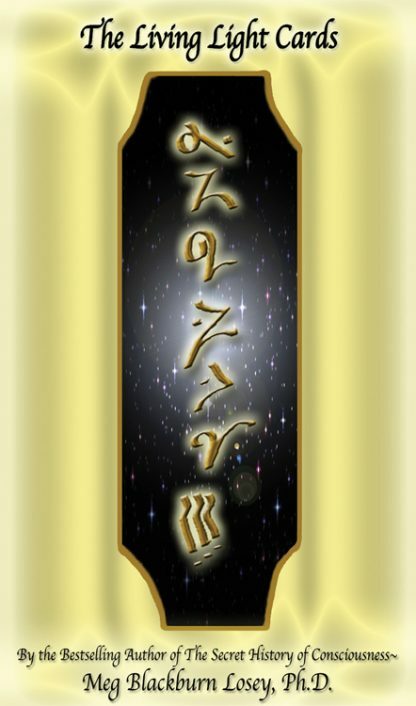 The Living Light Cards can be used for personal guidance, initiation, divination, and even for re-harmonizing the energy fields of the physical, mental, emotional, and spiritual bodies. The deck itself consists of 78 full-color cards with a Major Arcana that can be used specifically for spiritual guidance alone and a Minor Arcana can be used with the Major Arcana for any type of reading you desire. Specific layouts are provided based upon sacred geometry principals as well as layouts to be used for healing. Included are 78 full-color cards and an 88-page guide book. The cards are 3� wide x 5� high and are of excellent quality for long term use.